Comfort is an essential factor to consider when choosing the right furniture for your office. A good office should have comfortable chairs and desks as this where you spend the most time of your week. Corsica Series products include chairs and desks that are designed perfectly to allow workers to have a comfortable time when they are working. In addition to comfort, Corsica products are made with the office environment in mind. It is not every piece of good-looking furniture that is suitable for office use. However, you will get the appropriate office desk as there a wide variety of products to choose. Offices have varying sizes and shapes therefore you must choose furniture that will not make it appear too full or too empty. The space should be well occupied by furniture but still leave room to move around. Corsica collection has a variety of different sized office furniture therefore you easily identify what fits perfectly to your office space. Furnishing an office is not something you do every day therefore you want something stylish and long lasting. This series desks fit the bill. The desks are hand-crafted using AA-grade select wood veneers from North American. They are taken through 14-step finishing process to ensure that it has consistent beauty and quality. The desk surfaces are full 2″ thick with tapered edge. Corsica also has a combination of pedestals, returns, wall cabinets and hutches to take care of storage needs. They are well designed to create productive elegance and still maintain aesthetic appeal. Unused stationery in your office would be better placed in wall cabinets instead of filling up desks. Corsica series has different kinds of wall cabinets. You can choose models with single or double doors depending on the width of the cabinets. These cabinets are in different standard sizes hence you pick what fits your needs. You can, therefore, get a cabinet with enough opening room and still leave adequate space for people to pass. You may choose Corsica wall cabinets with fixed or adjustable shelves. Corsica Series office furniture is designed with cable grommets and channels so as to accommodate modern technology. Corsica series are, therefore, perfect for your modern office. 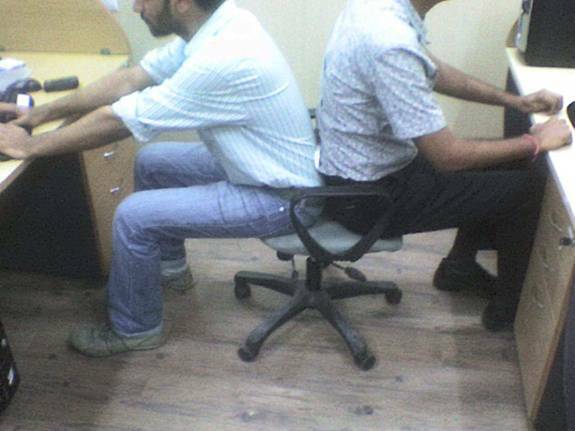 Due to the recent trend in smaller workstations we would like to introduce you to our new invention the Double Seater Workstation Chair. Guaranteed to cut your seating costs in Half!